While there were humorous moments, I admit to being a bit disappointed in Mindy Kaling's Is Everyone Hanging Out Without Me? And Other Concerns. I chuckled occasionally, but I never felt the need to roll on the floor laughing or even read a bit out loud to my husband, which I usually do when I find a passage amusing. 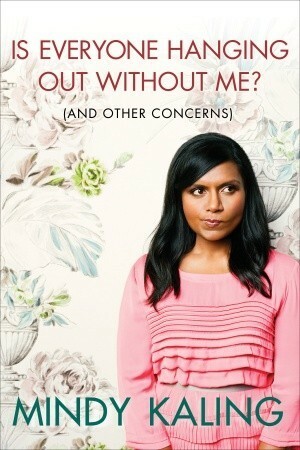 Ms. Kaling does get in some poignant social commentary, particularly about body image and bullying. Describing her childhood struggles with weight and the meanness of some of her classmates, she shares some brief scenes of bullying she endured both before and after some radical weight loss and notes, "Bullies have no code of conduct." True dat. She offers hope to the "quiet, observant kids" in high school who were never the lead in the school play, the star of the football team, or the class clown and points out the "wasteful frivolity" of a high school life modeled after Beverly Hills 90210 or John Cougar Mellancamp singing "Jack and Diane". "Are you kidding me? The thrill of living was high school? Come on, Mr. Cougar Mellancamp. Get a life." Her description of romantic comedies gave me a new lens through which to view the genre and may just increase my appreciation for these films. She considers romcoms to be "a subgenre of sci-fi, in which the world created therein has different rules than my regular human world." Her listing of the romcom stock characters - or "many specimens of women who I do not think exist in real life" - is spot-on and highlights the ridiculous caricatures found repeatedly in the genre. I'm not a huge fan of The Office, but I enjoyed reading (hearing) about her exploits as both an actress and a writer for the hit NBC show. I also appreciated the humility she showed in including some stories that don't show her in the best light, such as the fight she had with her agreeable and mild-mannered boss, Greg Daniels, which ended with him inviting her to leave if she couldn't get on board. After stomping out with her wounded pride, she eventually returned when she realized how foolish she'd been to walk out on her dream job. I loved her description of her parents' marriage - they're "pals" - and her plea to all those who are married. "Married people, it's up to you. It's entirely on your shoulders to keep this sinking institution afloat It's a stately old ship, and a lot of people, like me, want to get on board. Please be psyched and convey that psychedness to us. And always remember: so many many people are envious of what you have." With that, I've pretty much exhausted the highlights of this book for me. (Except for the brief shout-out to Mormons on page 158.) And that's not many highlights for a 200+ page book written by a funny woman whom I admire. Maybe you'll find it funnier than I did.